Many generations have seen the hey-day of one dominant media, and what Facebook and Google are to many of us today, MTV was to another generation of teens: and that is the kind of media with which you can while away hours upon hours. If skipping class to discuss the new Massive Attack video or staying up late to catch Alternative Nation sounds familiar, we have a treat in store for you today: MTV under the thumb. But can the app bring this cult television channel's appeal-of-days-gone-by onto our Android devices? And will it really provide total access to MTV as the Rolling Stones inspired app name suggests? We tell all in today's review. First off, I should clarify that MTV under the thumb is not a music streaming service. MTV may stand for Music Television, but in its present form MTV is all about exclusive content rather than broadcasting video clips. The application is a sort of key to MTV's content, that is to say that it allows users to access some of its programmes, music and celebrity news as well as a sort of forum that allows users to connect and chat via Facebook. There are several tabs allowing you quick access to the features listed above. There's 'Shows' via which you can access shows such as 'MTV Made' or 'Death Valley'. I should mention that accessing shows is possible from anywhere and everywhere, providing that the user has subscribed—you'll find more information regarding this in the Price/Performance Ratio category. 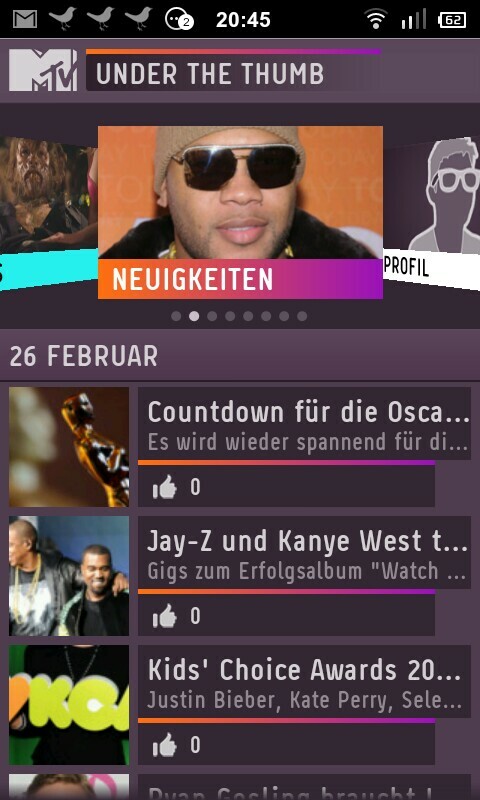 There are other tabs for news related to music/stars, editing your profile, chat, co-view and MTV Mobile. You can guess what the news and profile tabs are all about, but let's take a closer look at the other tabs. Chat and Co-View are both services that require being connected on Facebook. If you're not an avid Facebook user you won't be able to use these two functions, unfortunately. For those of you who do use Facebook and wish to take advantage of aforementioned functions, I can tell you that they work very well, especially for those users whose friends also use MTV under the thumb. If you're not interested in sharing/discussing what you've seen on MTV there's no need to establish a Facebook connection. My personal highlight is the 'Remote Control' tab which allows you to access a stationary browser via your smartphone. This lets you watch TV series on a big screen, be it TV or computer monitor. Unfortunately, this feature is contingent on the MTV server which strikes out occasionally. Throughout my test run I experienced one full day of server down time. I asked the (very competent) MTV authorities what was going on and they explained to me that due to maintenance and upgrades the server was down that particular day. The MTV Mobile tab is reserved for MTV mobile clients and is comprised of a few specials such as previews and other extras. Again, you'll find more details in the Price/Performance Ration section below. While all this sounds well and good, the app does have a few week points. I would personally like to be able to get more information related to music such as chart updates. To be fair, that’s not what the app sets out to do which is why this missing feature doesn’t weigh in too heavily into our rating of the application. However, there’s no excuse for missing shows, especially if according to the app description the producers at MTV have created so many shows that they weren’t able to air them all at the same time. So why are classic shows such as MTVs Pimp My Ride and MTVs Game On missing? It should’ve been possible to integrate these into the app’s repertoire. We got in touch with MTV in this regard and were assured that the developers plan to continuously upgrade the show repertoire, but for the time being it is something that still merits improvement, which is why we’re not awarding a full five star rating in this category. MTV under the thumb is a fun app that has a lot going for it. The playback speed is very good and the app provides users with news and amusing tidbits. Chat and share experiences with friends thanks to the integrated Facebook chat feature and even use the app as a remote control for watching exclusive content on a bigger screen. It’s important to keep in mind that users tend to have very diversified reactions to the types of shows and news segments broadcasted on MTV. Fans tend to be over the moon with what the app has to offer, others will find MTV’s programming is not their cup of tea and hence the app won’t be of much use to them. 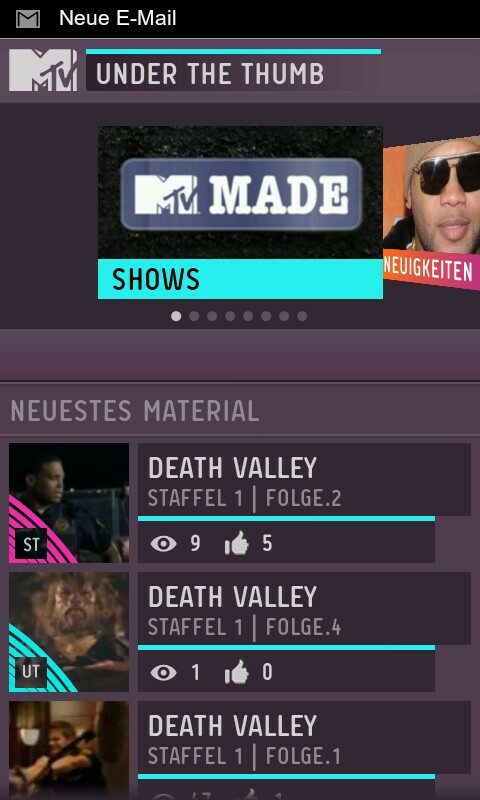 However, regardless of whether you’re an MTV yay or nay sayer, there’s no denying that the app is very well done. Using MTV under the thumb is very easy—controls are exemplary. It's intuitive and fast to use: simply hit a tab and then swipe between the different categories. Easy navigation and controls coupled with the bright graphics many of us will associate with the MTV aesthetic make for a fun and fluid user experience. MTV under the thumb ran very fluidly throughout our test phase. The application does take a moment to react on the HTC Desire and the Samsung Galaxy Gio, but starts up straight away on the HTC Sensation. 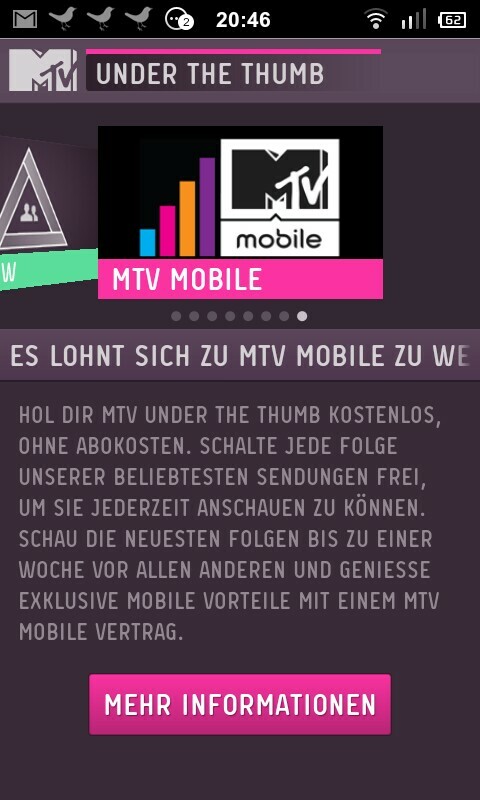 MTV under the thumb is available for free and without any ad banners from the Android Market. However, there are different subscriber models which incite users to shell out despite the app being branded as 'free'. Using the free version allows you to access all the features and services, though you will only have limited access to TV series in the sense that you will only be able to watch the first episode of a series (and throughout our test runs we found that even these did not always playback). Then there's Super Thumb which costs EUR2,99 per month (or EUR29,99 per year) and gives you unlimited access to all available series. You will also be able to share upgrades with up to five friends who will then also have unlimited access for one day only. Ultra Thumb is for MTV mobile users only who can take advantage of the full spectrum of features as well as special previews and five upgrades for friends—for free. I find 3 Euro per month to be a bit steep for what the app has to offer. This is largely due to the fact that certain series aren't accessible at all and this really drags down the price/performance ratio.